As you are aware by now, publicly traded Marchex announced that it would be split into two separate companies, with one company, Archeo, focusing on its domain assets. While announcing the news, Marchex also revealed the company’s top 500 domain sales (pdf). I don’t know if this excluded any sales subject to NDA, although the company may not sign NDAs when it comes to sales. A benefit of this public release of sales data is that the sales can be added to Ron Jackson’s sales report so that we can all reference these sales in the future. One issue is that Marchex did not reveal the sale date for these transactions, so Ron couldn’t easily place these sales in the correct sales charts. I think this is reasonable, but I really think people reference the annual top sales charts more regularly. That said, I took it upon myself to see if I could find the best guess when the highest value deals were transacted using the invaluable DomainTools Whois History tool. If there was any question about when the transfer took place, I noted that in lieu of the year. I also linked to the change, whether it was a registrant change and/or a registrar change. I hope Ron reconsiders this and will use the information below to add the individual sales to the sales chart. Year 2012 is pretty weak. 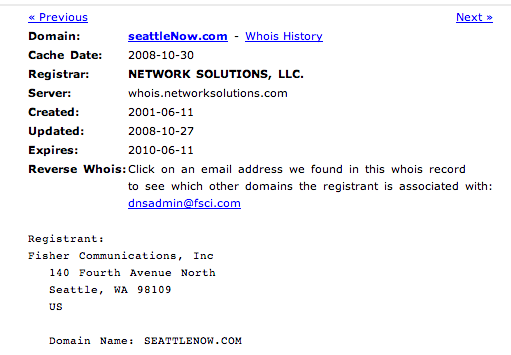 I doubt SeattleNow.com was purchased for $125,000 back in 2008. They released their “Groupon clone” site in December of 2011. Groupon didn’t even launch until October of 2008. Hmm…. I will have a look when I get back home to see. Appears the domain was created in 2001 and was a basic directory landing page. Not sure why they decided the name was worth $125k. They also purchased http://PortlandNow.com for the same amount which never became of anything and is just a blank page. I hope whoever was the sole negotiator for Marchex during those 3yrs received a fat bonus for all those deals, lol. I don’t think the whois change would give an accurate date for actual sale. Some buyers take months to change whois, some longer (some never). The only way you will get reliable dates is if you get them from Marchex. I think without accurate dates, the approach Ron is taking is the way to go.